Every now and then I make a piece I love so much, I really, really don’t want to let it go. This is one of those pieces. Two weeks ago, I was organizing my ribbon and rerolling the velvet ribbons I have. As I rolled this ribbon, feeling its lush softness, the image of it edging a hat came to mind. I knew this dramatic grape purple had to have a dramatic floral compliment. The visual stuck. No, it screamed at me. Since I declared this past week was going to be hat week (and next week will be as well), I decided to sneak this hat in between my hat requests. As I finished it, I fell in love with it. I am still going to let it go though (Etsy). It is a fashionable straw shape hand sewn in a fine quarter inch Milan plait. The straw dried slightly darker than other pieces this year. I rather love the depth the color adds. The crown is shallow with a hint of shaping while the brim curves down all around with a dip front and back. 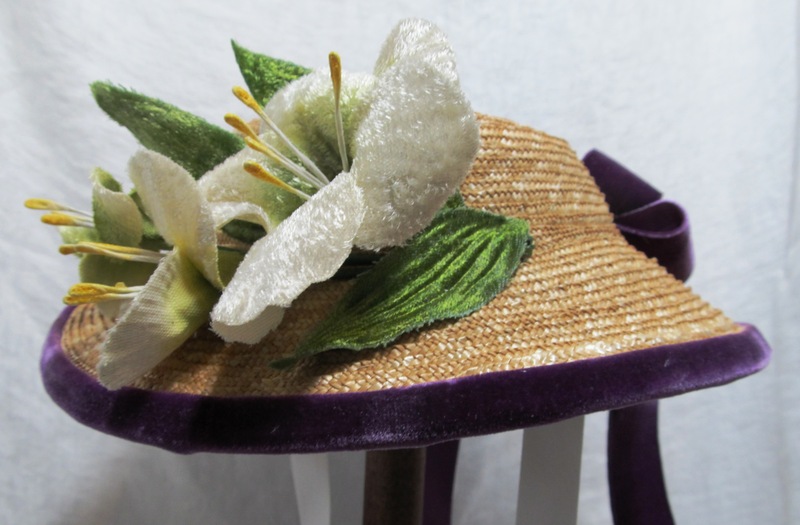 The hat is trimmed with over 3 yards of Hyman Hendler’s satin back velvet ribbon. They call it Raspberry. It makes me think of the grapes growing around the Finger Lakes and the tasty jams and wines they make. Accenting the lush velvet ribbon is a simple arrangement of dramatic ivory lilies. I added a pair of silk ribbon ties that can be tied under the hair and help hold it in place.